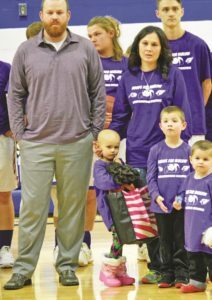 ALBANY- Several community members from Brodhead, Evansville and Albany packed the Albany High School gymnasium last Saturday to support a four-year-old girl, Harlow Phillips, who is battling neuroblastoma. Life changed for the Phillip’s family on Labor Day weekend. Harlow woke up in the middle of the night screaming in pain.